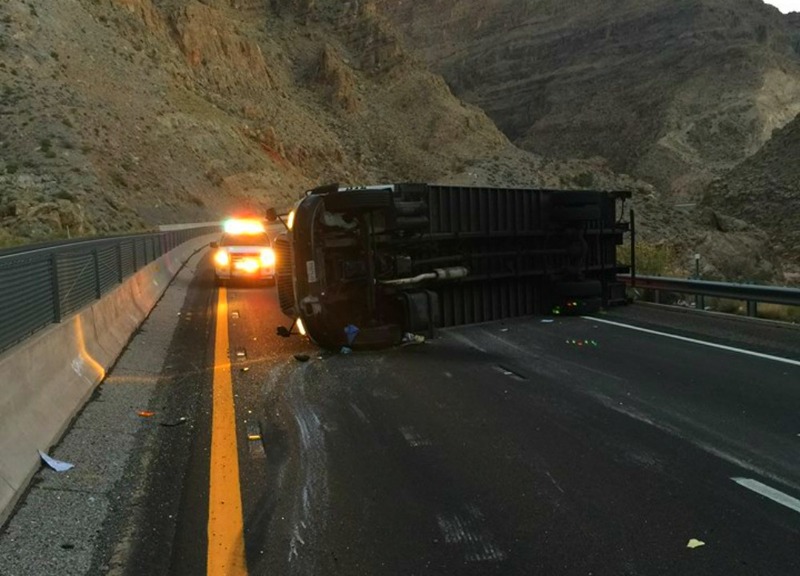 VIRGIN RIVER GORGE, Ariz. — A driver suspected of falling asleep lost control of a delivery truck and crashed into a barrier in the Virgin River Gorge Thursday, blocking both lanes of northbound traffic for more than three hours. 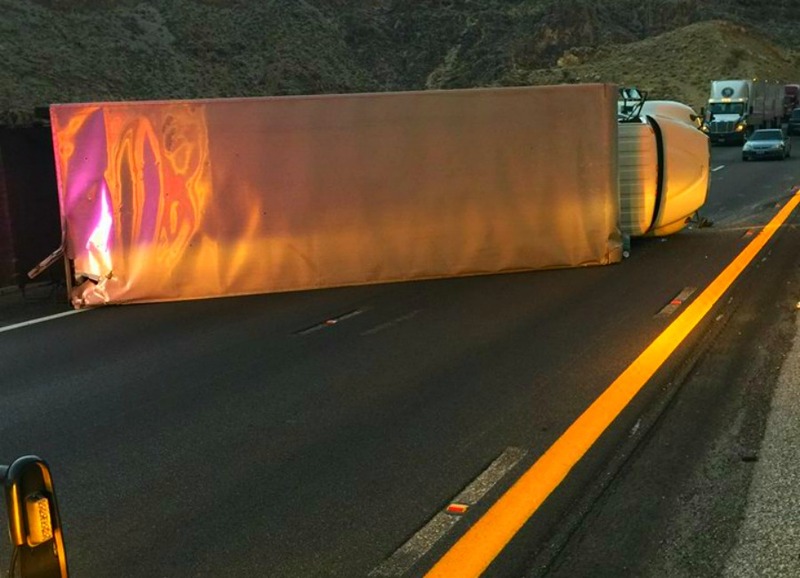 Shortly after 6 a.m. officers and emergency personnel responded to a reported rollover on Interstate 15 northbound near mile marker 16, Arizona Department of Public Safety Trooper Greg McBride said. Once on scene officers found a two axle commercial delivery truck tipped over on its side with the driver, a man in his 30s, outside of the vehicle. With both northbound lanes completely blocked, traffic was backing up fairly quickly, the trooper said. Officers and a fire crew from Beaver Dam/Littlefield Fire Department started tending to the scene as two wreckers made their way to the area that was quickly becoming inaccessible, the trooper said. One of Beaver Dam’s fire trucks was forced to turn around because it was virtually impossible to make it through the backup of vehicles that was by then a few miles long. Officers found after speaking to the driver that at some point, as he was heading northbound, he veered to the right of the road and hit the guardrail, McBride said. The driver then overcorrected by turning the wheel sharply to the left, which sent the truck over the two lanes of traffic and into a barrier before it overturned. 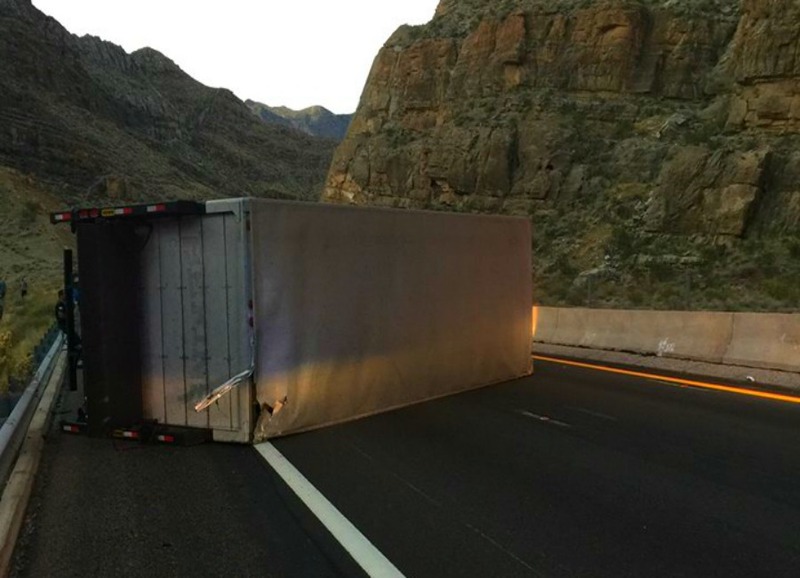 The driver reported that he sustained injuries to his right leg. He was helped out of his truck immediately after the crash by another truck driver who stopped when he saw the crash unfold. The driver declined transport to the hospital at that time and told officers he would get checked out on his own after the truck was towed. Once the wreckers arrived the towing crew was able to pull the truck to an upright position and soon after the damaged truck was towed from the scene. During the accident investigation officers found that the driver may have fallen asleep at the wheel, McBride said. 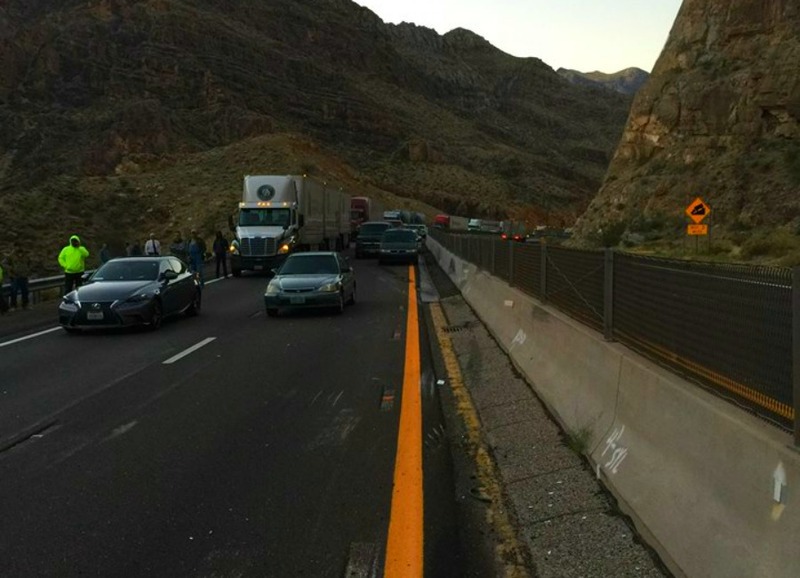 After more than three hours both northbound lanes were cleared and traffic began to resume through the area, but by then the backup of vehicles was more than six miles long. Consequently, several drivers were having problems trying to restart their trucks, while others who took the opportunity to sleep while the lanes were blocked were being awakened by officers and others. After a short time everyone was up and moving through the gorge by 9:30 a.m. and the backup was cleared, Sgt. John Bottoms with the Arizona Department of Public Safety said. The Arizona Department of Public Safety and Beaver Dam/Littlefield Fire Department responded and tended to the scene. St. George News Reporter Kimberly Scott contributed to this report. First of all, It doesn’t matter how many laws there are they don’t give truck drivers enough time to sleep. I know, if they were to fall asleep after 5 minutes of stopping there would be enough time, but who does that? Second of all, I hope he wasn’t injured too badly. Everyone that has to wait 3 hours, calm down and think of the driver. God bless the man that helped the driver after the accident. Oh my golly gee whiz this is terrible I hope the truck can be saved and I hope no desert tortoise develops PTSD from the accident . Oh yeah I almost forgot about the driver hopefully he will recover and get another job ! I’m sure glad I don’t have to work for all living ! At 2:10 am? Yeah, we believe you don’t work. Yeah ! we believe you don’t work ! L0L you said it stupid now get a job ! all living HaH like all the tax payers that pay for dream house and boat LOL.